The place where Jesus spent most of his life and started his ministry abounds with churches, convents and monasteries that preserve and testify to the ancient sites. Along with church spires, you’ll see the minarets of mosques, as Israel’s largest Arab city is 60 percent Muslim; Arab Christians make up most of the rest of the population. Arab vendors in the tiny shops of the souk, or open-air market, offer a revealing slice of life to those who wander its narrow alleyways. 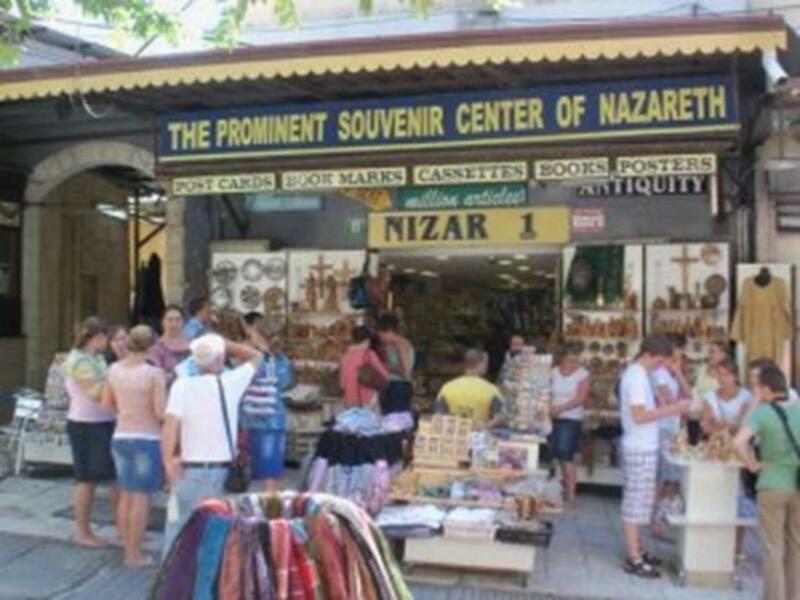 The souk, cafes and souvenir shops certainly add local color for groups coming to visit the Basilica of the Annunciation, whose domed roof dominates the Nazareth skyline. 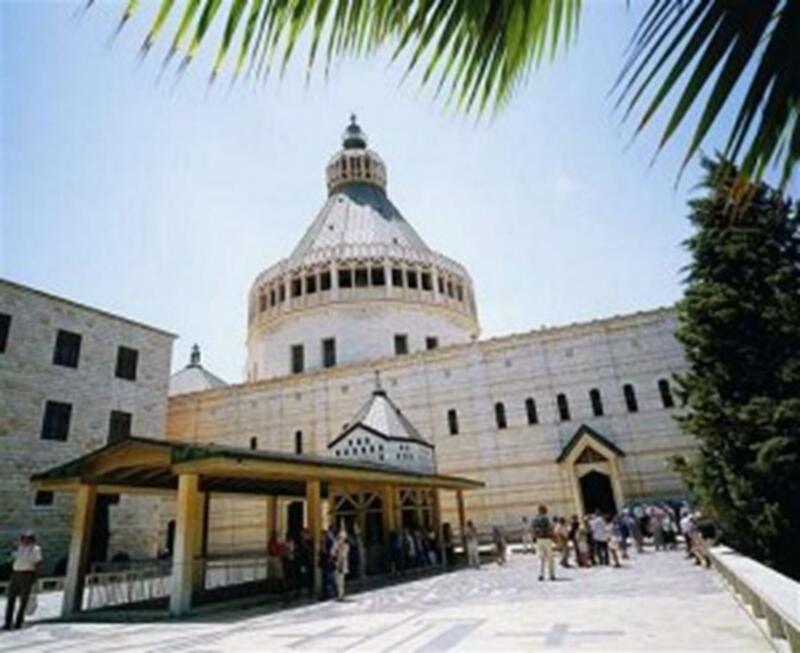 Consecrated in 1969, the largest church in the Middle East, maintained by the Franciscan Order, occupies the site of Mary’s home, where, according to Roman Catholic tradition, Gabriel made his announcement, or annunciation. 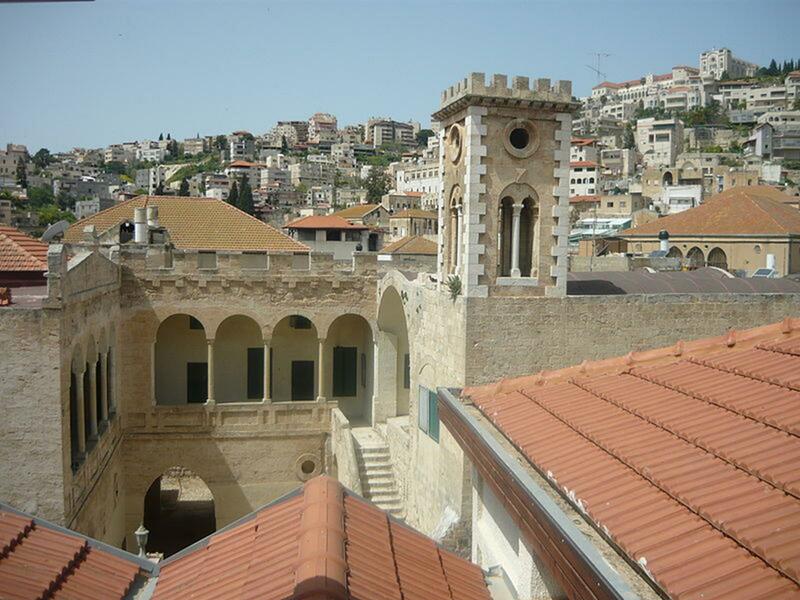 Architecturally impressive, it is the focal point for most tourists in Nazareth. The church’s dimly lit lower level has a shrine built in the cave, or grotto, that formed part of Mary’s house. Visible are mosaics and other remnants of previous churches built on the site during the Byzantine and Crusader eras. A spiral staircase leads to the vast upper church, visible through the opening that connects the levels, and its most distinguishing feature—a grand cupola rising 195 feet above ground. In the shape of an upside-down lily, the ribbed dome represents Mary’s purity. The huge mosaic behind the altar shows Jesus and Peter with an enthroned Mary behind them. Walls in the back of the nave are adorned with mosaic and ceramic panels of the Madonna holding the baby Jesus, with clothing, facial features and artistic styles reflecting each donor nation. Included are works from France, Portugal, Canada and the United States, to name a few of the countries that contributed artwork. Mother-child panels in the courtyard represent other lands, from Japan and China to Ecuador and Uruguay. Seeing Mary in a kimono or in a turban with bright African garb certainly provides the visitor a global perspective. Adjacent to the colossal church are archaeological remains of the ancient village built into the caves. Also on the basilica grounds is the St. Joseph’s Church, built over a cave that, according to tradition, served as the carpentry workshop of Joseph, Jesus’ earthly father. In the crypt are rock-hewn chambers and remains of a Jewish ritual bath later used for Christian baptisms, an intriguing connection between the two faiths. The church was constructed in 1914 over the ruins of earlier churches. The sidewalks outside the Basilica of the Annunciation are lined with souvenir shops catering to pilgrims. For sale are manger sets and statues carved from olive wood, rosaries and icons, plus caftans, shawls, handbags and other examples of Palestinian embroidery. You can buy a set of vials containing “holy olive oil,” “holy soil” and Jordan River water. For a sweet treat, try a honey-soaked Palestinian pastry or dig into a warm slice of kanafeh, a white-cheese pastry sprinkled with pistachios and covered with syrup. You’ll also find stands selling falafel, or deep-fried chickpea balls with salad in pita bread, and shawarma, a sandwich packed with grilled lamb meat sliced from a spit and salad. And everyone seems to like hummus, a chickpea spread served in a bowl and eaten with bread. St. Gabriel Greek Orthodox Church of the Annunciation, less than a mile from the Saraya in the city of Nazareth, was built over Nazareth’s only natural water source, a spring dubbed Mary’s Well. Greek Orthodox Christians believe it’s the place where Gabriel made his announcement to Mary. 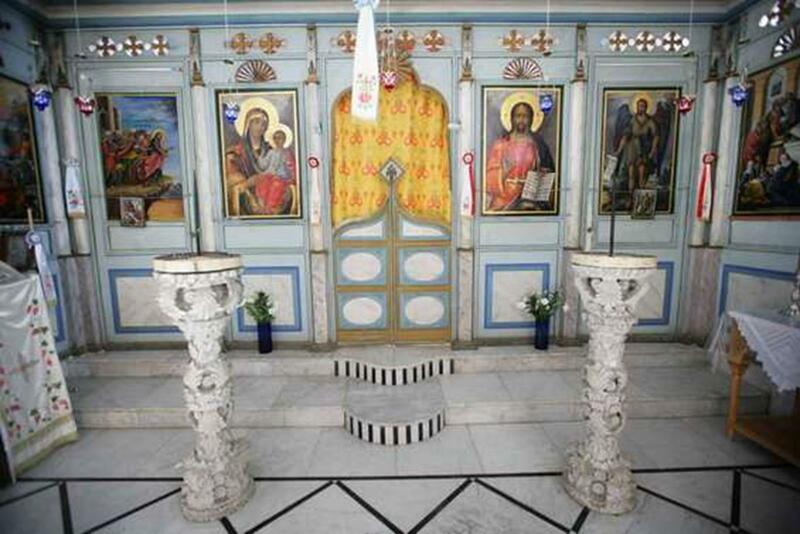 The ornate 18th century church, built during the Ottoman period, has exquisite frescoes, icons and gilt chandeliers. Remnants of two older churches also are visible, proving that the site was considered holy to the earliest Christians. Even for the non-Orthodox, the site is important because it’s probably where the Holy Family came to draw water and maybe even bathe. The spring still flows out of the rocks from the hillside behind the church, as it did 2,000 years ago. The sound of water coming from a fountain inside adds to the spiritual feeling. Tour groups in Nazareth also may visit Nazareth Village, a group of reconstructed workshops, farmsteads and houses where costumed interpreters go about everyday tasks common in biblical times. Several convents and monasteries in Nazareth welcome groups to view their gardens or religious artifacts. Some offer overnight accommodations. In medieval times, Trondheim was Norway’s capital and the leading religious pilgrimage destination in Northern Europe. Thanks to renewed interest that began in the 1980s, Christian pilgrims today flock to this vibrant city on the coast of Central Norway, specifically to Nidaros Cathedral, the country’s largest and most important church, and nearby Nidaros Pilgrim Centre. Portland, Maine’s largest city, is located on a peninsula at the mouth of the Fore River part of Casco Bay. Initially inhabited by Native Americans, Portland became a major British trading and fishing settlement in 1632. Portland enjoyed prosperity till destroyed by the Great Fire in 1866. Today, the city’s symbol is the Phoenix, the mythical bird emerging from the ashes, as Portland was refashioned in the Victorian style following the Great Fire.